When the most pure Mother and Ever-Virgin Mary's forty days of purification had been fulfilled, she took her first-born Son to Jerusalem on this, the fortieth day after His birth, that she might present Him in the temple according to the Law of Moses, which teaches that every first-born male child be dedicated to God, and also that she might offer the sacrifice of a pair of turtle-doves or two young pigeons, as required by the Law (Luke 2:22-24; Exod. 13:2; Lev. 12:6-8). On this same day, a just and devout man, the greatly aged Symeon, was also present in the temple, being guided by the Holy Spirit. For a long time, this man had been awaiting the salvation of God, and he had been informed by divine revelation that he would not die until he beheld the Lord's Christ. Thus, when he beheld Him at that time and took Him up into his aged arms, he gave glory to God, singing: "Now lettest Thou Thy servant depart in peace, O Master. . ." And he confessed that he would close his eyes joyfully, since he had seen the Light of revelation for the nations and the Glory of Israel (Luke 2:25-32). From ancient times, the Holy Church has retained this tradition of the churching of the mother and new-born child on the fortieth day and of the reading of prayers of purification. The Apodosis of the Feast of the Meeting in the Temple is usually on the 9th of February. This, however, may vary if the Feast falls within the period of the Triodion. Should this occur, the Typicon should be consulted for specific information concerning the Apodosis of the Feast. 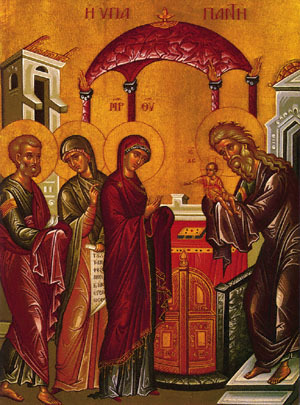 Share the feast of The Presentation of Our Lord and Savior in the Temple with an icon greeting ecard.